Here is a pic of a cleaning I gave an M1730 on the weekend. Great shots man especially like the shot of the chunk of dust you had there. This should be a bit of eye opener for those with laptops I encourage you all to take a look the rest of the shots and the importance of keeping those heatsinks and fans clean. Laptops are far more sensitive thermally, poor airflow can lead to a thermal death far sooner than any desktop will ever see. How old is that laptop and is that under normal to moderate use? I like your cleanup shots. I perform a full cleanout on my laptop every 6 months. My Vostro 1400 is usually on in lecture halls, at home and in the car only so I never get such a massive dust buildup however, the CPU heatsink thing does get clogged. 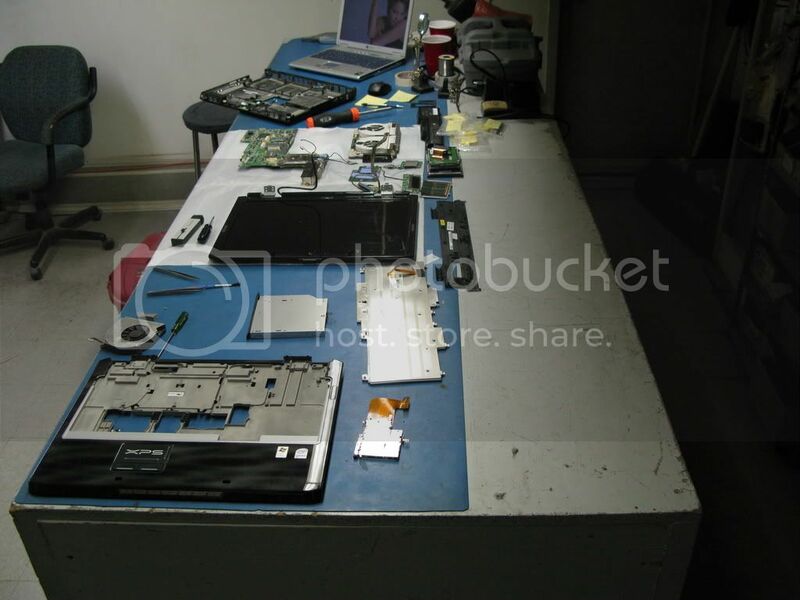 Ugh, I really need to open up my dell M2010 and do a thourough cleaning. Had it for almost 2 years now and the gpu has been overheating to the point of lockups. There's only so much dust you can get rid of from the outside with a can of compressed air. Hey mklym, where abouts in "central" alberta are you.... wanna crack open my dell M2010? Edit: just got it back together, hmm I should have waited until I was home and not on the road. Got it well cleaned (only very fine thin layer of dust, nothing large or "clogging") But I got it all apart, mostly the gpu cooler that I was suspecting. Oops, no new thermal compound with me. Running chip on copper no compound and well my temps went up 25c :( BUT I no longer get any flicker/lockups in the game that was giving me trouble, So i have no clue what I did that may have solved that. Last edited by 4DoorGTZ; January 27, 2009 at 11:04 PM. Once a week? Damn your house must be dusty! Nice job and great pics. I think it's time I pulled my 1530 apart again. I've done it once since I've owned it. @cork45, heat probably kills most laptops, that are not physically abused. The hardware is crammed together so airflow is very important. The dirtier the inside, the lower the airflow. Dust build-up, even a light coating, causes problems. Fan blades do not move as much air, heatsinks can not dissipate heat as efficiently, or very little when clogged, and even surface mounted chips run hotter. You may not run your laptop as hard as your gaming rig, but internal temps could be higher in the laptop. Thanks for the positive comments on the pics. I really need to spend more time with my camera. I get into a tear-down, and forget about pics, until it is apart. I should be taking step-by-step pics. 4DoorGTZ, I am sending you a PM.